Sold KT for £32m best replacements? Got past Arsenal with a late winner and in to the quarters had my lead at the top cut to 4 points as I rested most of the team starting to really enjoy this save. Won the League Cup. 12 points clear in the league. You know you're moving up in the foodchain when you've got a veritable star fleet of players heading off on internationals. Particularly proud of the 6 Italian senior call ups, along with 5 in the U21s. Had a quiet window really, no headline signings apart from Marco Varnier from Atalanta. Decided that Badiashile could probably do with a loan to help accelerate his development, wasn't getting into the team enough as my 4th option. Sent him to Augsburg, was between them and Frankfurt and I very nearly rejected Frankfurt on account of Augsburg having better training facilities, but I left it up to him and he ended up choosing Augsburg anyway. Varnier is an immediate starting calibre defender to add to the rotation, not exactly cheap at 18.75m but a solid investment to make in a 23 y/o Italian player. Ended up going big on regens to flesh out my youth ranks, haven't been overly impressed with the standard we've been generating ourselves despite me upgrading the recruitment whenever possible. I basically just pulled the trigger on every 4 gold + 1 black star potential 17 y/o that landed on my scout reports desk, as long as they didn't have a prohibitive price tag. 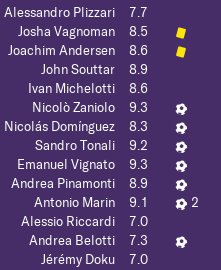 Spent a total of 17.25m on 9 players, the highlight probably being a young Torino centre half who has been dubbed the 'new Franco Baresi.' So a lot to live up to. Also a French lad from Nancy dubbed the 'new Maxime Bossis.' Will confess to having to Google him. Spotted a good Bosman flipping opportunity in the form of Filipe Soares, who was available on a free after his Estoril contract lapsed. Riccardi's emergence last year has pushed Jankto down the pecking order, so I thought I might as well utilise his spot for a bit of profiteering. Keen to get him back into the fold as I want to retain as many links to the irl Samp squad for as long as possible, so I've loaned him out to Wolves for now. Plan is to play Soares and hopefully drum up some interest for a quick turnaround sale in January, if successful I'd then cancel Jankto's loan. Soares is valued at 23.5m so could be a nice chunk of money to basically cover the costs of my regen splurge. Decided that since I'm mixing it with the big boys now it makes sense to behave like an elite club, so rather than going down the cost cutting route and loaning Audero out again I'm going to retain him in the squad as a top notch backup keeper. Having to forego 3m in loan fees and he's on 26.5k which is reasonably steep for a bench warmer, but it's worth paying for quality cover rather than relying on sub-par guys like Krapikas or Hutvagner in the event of Plizzari picking up any injuries. Only a couple of minor sales, Cornet to Udinese for 7.75m and Kownacki to Bremen for 6.5m. Loan army is set to generate an impressive 36m in loan fee income. CL group is reasonable, 1st seeds this time around on account of our Europa League win and we've landed United, Leverkusen and RB Salzburg. Doing my usual and getting bored 2/3 seasons in. Just bought this the other day and they've seemed to revamped the training quite a bit. Do any of you tweek the training calender, im too feart to touch it so far. * *. This was unexpected. Think I'd have to describe it as the magnum opus of this save, however many seasons I carry it on we'll not have another game or result quite like that. The match ratings for the starters are ludicrously good. The 'worst' is Plizzari who 'only' notched up a 7.7. Then four outfielders with a 9+, and the rest ranging from 8.3 to 8.9. 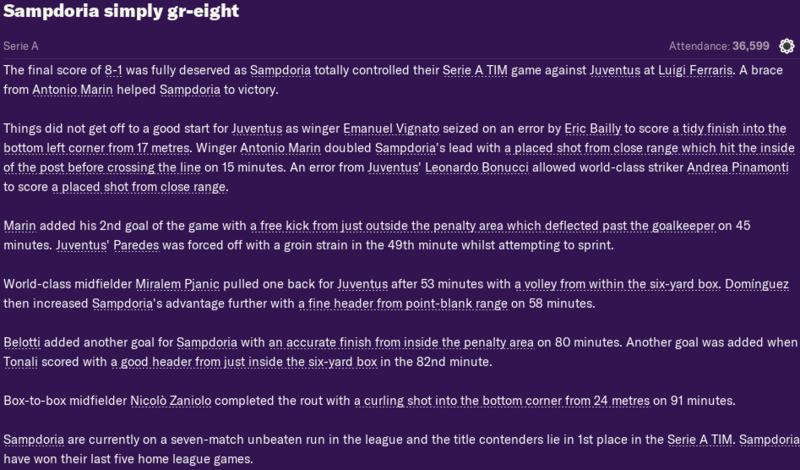 The win essentially clinches the scudetto for us. Lose and the gap would have been down to 1 point, iirc. Now we can mathematically wrap things up if we beat Genoa at home next up. As for Europe, we've developed a very distinct methodology for advancing. Basically, we blitz them in the first leg at home leaving us with very little to do in the next leg. 3-1 against Man City, 4-1 against Atleti, and the trend would continue with a thoroughly dominant 3-0 over Spurs. Second leg wasn't quite a formality, but we knew if we managed an a.g. we'd have a massive advantage. 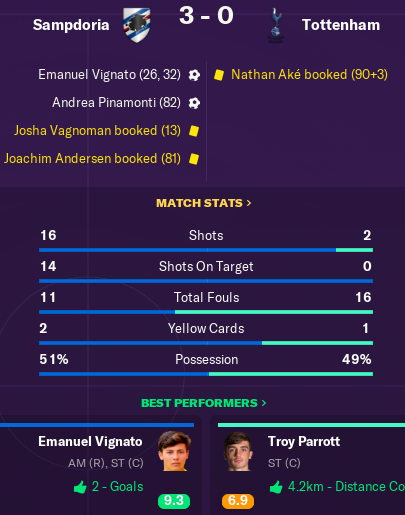 Ended up being a 2-2 draw, not used to an opponent registering 60% possession against us but we weren't exactly under the pump. We very quickly equalised after Alli scored early, and we then had the four goal buffer to protect us. Second half featured a penalty for each team, but the outcome was never in doubt. Real lost the first leg of their semi, Porto winning 1-0 and Real finishing with 9 men after a couple of sending offs. 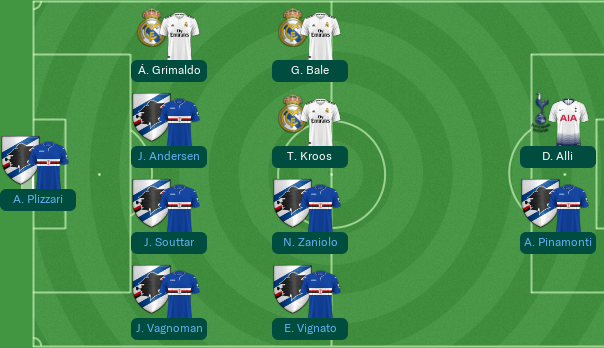 But Real turned it around in the second leg, thrashing Porto 4-0. So the Barcelona final is all set. I usually just leave it to the assistant, he sets up a varied schedule which tends to have a different focus each weak. Easy to then just edit what he's done if you want to throw in a couple of specific sessions yourself. Sometimes you'll get the players moaning about their 'unit' not getting enough attention (training split into three units: keepers, defenders and attackers iirc), so you can then set up some specific sessions focusing on them to keep them happy. Got to be the best 16 year old in the game. Paid £3 million for him. Sold Griffiths to buy him. 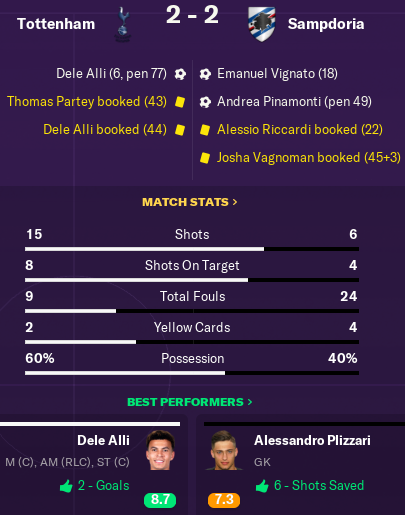 Won the league by 6 points over Poch's Milan in the end. 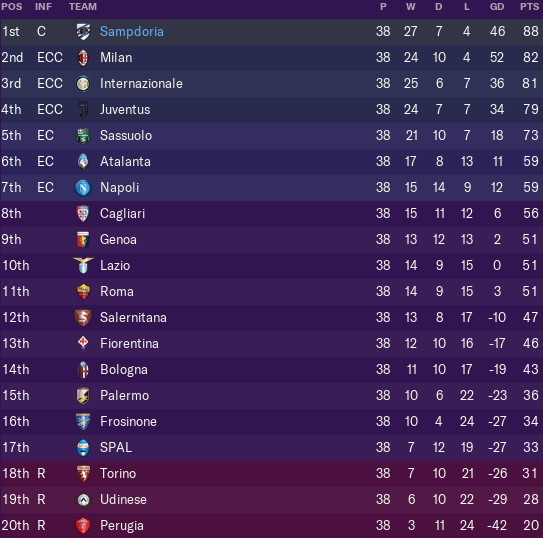 Clinched the scudetto in the derby despite Genoa holding us to a 0-0 draw. Thrashed Torino 4-2 to hasten their relegation. 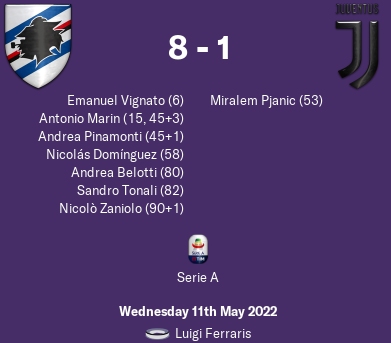 Then played the last league fixture of the season against Roma, annoyingly scheduled a mere 3 days ahead of the CL final. Had to rest a bunch of players so ended the season with a draw, missing the chance to break the 90+ barrier. 3 points worse off than last season, but who really cares about that. Allegri has paid the price for Juve's slump to 4th, sacked on account becoming 'stale' according to the news report. The main contenders to replace him are Sampaoli, Conceicao and Nagelsman. Serie B promoted sides are Empoli, Parma and Cittadella. CL final turned out to be a lot less scary than I'd anticipated. We conceded early to a Toni Kroos free kick which sort of skipped over Vagnoman's head. But despite taking the lead they never took the initiative, and we were always on the front foot. 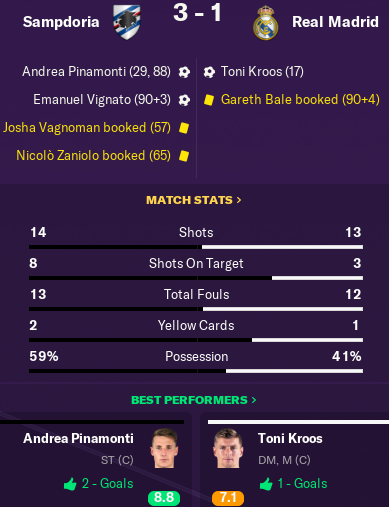 Pinamonti the clear MOTM for his two decisive goals, one to drag us level well before the break and the other just as I was preparing for the possibility of extra time + pens. Vignato then put the icing on the cake with his goal deep into stoppage time. Delighted to finally break my CL duck after 19 seasons of FMing. Though strictly speaking my Koln save is stopped on the verge of a CL final against Liverpool which I've not played yet, so I could have done it about 8 seasons ago prior to both my Brentford and Samp saves. But we'll gloss over that. The long wait is over. The new owner has given me a contract extension on the back of our CL triumph. I typically don't ask for much, was previously on 33k, but his opening offer was a massive 115k. Decided it would be unrealistic to artificially lower that for the sake of saving the club money, so I agreed 110k along with some bonuses for winning comps. Asked him to stump up for a new stadium in the negotiations, but he refused. Did however accept a request to expand the stadium, so the Gigi Ferraris will be getting a bit of a spruce up. 9,149 seats due to be completed by November, which will bump the capacity up to 45,748. We only averaged an attendance of about 32k in the league but it will be nice to get a big boost on the European nights, which I suspect we'll sell out more often than not. We've had to fork out 37m of our own money to fund the work, though as it's a council-owned ground they gave us an 11m grant to grease the wheels a bit. Worthwhile to put a dent in our season profit so there's less for the taxman to * as well. Genoa are contributing nothing to the project, * freeloaders. Pinamonti was the stand out goalscorer with his 26 in all comps. Scored a massive 10 in the Champions League which claimed him the CL golden boot. Vignato was the best player overall, though, notching up both the fan vote for player of the year and the award for young player of the year. Scored 8 CL goals so he ended up a clear 2nd in the CL golden boot race, one ahead of Leroy Sane. Happy I held on to Belotti who has done well. Tends to score important goals. Marin's production has dropped off massively from previous seasons, still going to persist with him though as he's still young. Doku not quite doing enough to displace him as the clear first-choice on the left, suspect it will be another season of picking between the two quite regularly whereas the rest of the positions in the ideal starting XI have a better defined first-choice. Combination of the Club World Cup fixtures and the Qatar World Cup hiatus means I'm anticipating an absolute mess of a schedule next season. Got this belter for £2.5 million from Defensa y Justicia. Got Gary Cahill on a free transfer as well. Was one of my best last season but need to let him go for that sort of money. Edit: His value went up to £41 million and his media description is world class midfielder. Does anyone play this on their phone? The most balanced centre half pairing i've ever had. With one being left footed and one being right footed.